Tales of the Fox Lake Area. These stories contain historical and biographical information that we think is essential to understanding the character of the people who settled here, and therefore the history of the area. French explorers in the early 1600s were the first white men to visit the Fox Lake area, but Indians long preceded them, according to the official history of Fox Lake produced for the village's golden anniversary in 1957. In 1836 this part of the American frontier was opened to white settlers by federal government treaty with the Indians. The rich and fertile land teemed with wild rice, game and fish. Adventurous pioneers already had staked out homesteads on land they liked, usually with water frontage. There is no record of any serious violence having befallen any of these families, though the Indians already had firearms. Only their little boys were still using bows and arrows. A post office called "Fox Lake" was established in 1859 at Monaville (by Fairfield Rd. ), a busy farm town in Civil War days. Mail came by stage coach from Little Fort (Waukegan) three times a week and was distributed by buggy, horseback and boat. What became the Village of Fox Lake was then known as Nippersink Point. All roads ended at Oak St. until a bridge was built during World War I, using wood because of a metal shortage. The railroad reached Ingleside in 1899, called "Fox Lake" station, and was finished in 1900 to "Nippersink Point." Later the stations were renamed Ingleside and Fox Lake [as they remain today]. Fox Lake was granted its village charter on April 13, 1907. In May they elected John Brown, a storekeeper and original postmaster, as the first village president. The Fox Lake Volunteer Fire Dept. also was founded [at a meeting in December] 1907 [and chartered by the state in 1908]. The department had a horse-drawn pumper and a hose-reel on wheels that could be hitched up to horses or pulled by hand. Outbreak of a fire was heralded by ringing a bell atop the village hall [after that was built]. The village well and water system was set up during the 1920s, financed by water assessments on all property owners, though lines were only extended to streets with buildings. Conversion to residential from resort began during the 1930s' depression, as unemployed workers moved to their cottages when unable to continue paying rent in the city. The village also benefited from government projects by the Works Progress Administration and Civilian Conservation Corps [WPA and CCC]. They helped build new roads, bridges and seawalls, fill in sloughs and level hills. The Fox Lake Public Library opened in 1939 as WPA Project 80032 with a grant of 1,200 volumes. It was initiated by the Fox Lake Women's Club, who agreed to serve as the local sponsor without pay. St. Bede's Catholic Church dates back to the first settlers. The Ingleside Methodist Church began meeting in homes around 1897 [as Ingleside Community Church]. Fox Lake Community Church [also] started as a non-denominational congregation in 1926, Trinity Lutheran at Long Lake in 1940 and the Fox Lake Baptist Church in 1955. When Fox Lake was first incorporated, population estimates ranged from 200 to 400. A booklet advertised 34 hotels and resorts, five taverns, four boat lines, two boat builders, two livery stables, two clubs and 16 other businesses. The village population count totals 7,500 as of the 1990 census. The Fox Lake Area Chamber of Commerce and Industry lists 168 member businesses. Formerly blocked on the north by Nippersink Lake, Fox Lake [Village] now stretches northward past Rte. 173, westward into McHenry County and southward to Big Hollow. Both housing and business developments are booming as the village nears its 90th anniversary in 1997. Published January 3, 1957, in the Fox Lake Press, Lakeland Publishers. A tavern, in the early days of the Fox Lake area, was a place where the traveler could find food and lodging for himself and his horse. It was the center of the settler's meager social life. In preparing this story of the first taverns and inns and the first families, Walsh said he found it difficult to determine the proper sequence. There was no one left here who was then alive. So he talked with people whose ancestors lived here--those few he could find--and checked the few early and often inadequate records. The hardy people who came into the country of the Pistakee Lakes in those early days came to trap fur, fish and hunt, and later became guides and boatmen. They were rough, strong people, who knew how to subsist in the wilderness and deal with the Indians. In about 1880 Deveraux Goodale established a tavern at Big Hollow, as it is now known. The settlement was called Deighten. This was the first public house in the area which provided shelter for the traveler and his horse. The story of Big Hollow and its part in the history of this area will be told later. In those early days, the code of the frontier, before the inns were established, assured hospitality for travelers at every settler's cabin. No questions were asked. The traveler brought news of the outside world and was always welcome. In 1833 Robert Stanley left New England with his wife and son to make a new home in the west. He had heard of the forests, the lakes, and the rivers in this new land. The east no longer had a place for the woodsman, and he decided to move on. The Stanleys traveled by horse and wagon on the long trail west. They stopped for a time at Oneida, N.Y., where a son, Robert E., Jr., was born. They reached Chicago in 1835. Robert, Sr., worked as a carpenter there before he decided to make his home in the virgin forests around the Pistakee Lakes. He built a log cabin near Big Hollow, trapped, and farmed in a small way. In 1850 the new township of Goodale was formed, and Robert Stanley was elected a road commissioner at the first township election in April. Some years earlier he built a log lodge on the shore of Nippersink Lake, to accommodate hunters and travelers who came that way. He and his sons trapped fur. A muskrat pelt was worth seven cents. Robert received $80 for his work. Robert, Jr., had grown to become a carpenter and boat builder. The design and construction of his boats won favorable mention in a national sportsmen's magazine at a later date. In 1857, young Robert built a house of milled lumber for John Sayles on the site where the family of John's wife, Betsy, had lived in a log cabin for many years. Robert received $80 for his work. The house stood on a hill near the site of the (old) Fox Lake Village Hall. This house was rebuilt shortly before Mrs. Hattie Schmidt lived there (in 1957). By this time the Stanleys were building and selling hunting and fishing boats. They were serving as guides, and hunting, fishing and trapping and were becoming very well established. Young Robert served in the Union army during the Civil War. After the war he married and took over the resort business. His parents and the two youngest boys took off for Nebraska, where they had other relatives and where there was more elbow room. The region about the Pistakee Lakes was getting too crowded for them. In the Pistakee Lakes area, young Robert attracted many sportsmen to his resort. Guiding sportsmen and building boats was a paying business. Like other resort owners, he cut ice on the lakes in winter and stored it in large sheds under protective layers of swamp hay which kept the ice through the summer. Large quantities of fish and game were hung in the ice houses for guests and friends to take home at the end of their stays. Robert Jr. had three sons and a daughter, all skilled in the life of hunter and trapper, and in the art of guiding sportsmen through the still wild country. Game abounded. The waters were full of fish, and in autumn flocks of ducks and geese darkened the skies. The Stanley resort burned to the ground in 1885. Robert and his sons built a small frame hotel with a pavilion where dances were held. About 1895 this place was sold to Otto Muehrke and (the Stanleys) moved to a house on Point Comfort. Otto Muehrke built a large addition to the small hotel, which soon became known as the Muehrke Illinois Hotel, a place famous for years. It stood until the 1930s, when the hotel was torn down, and the land was turned into a resort park by a Mr. Lowing. Robert Stanley's son Bert had married and lived near the Elgin Waltonian Club on the shore of Fox Lake. About 1900 he built a home at the top of the hill on Forest Ave., he continued to build boats, and kept rooms for his friends who came to hunt and fish. He established his parents in a house nearby, which in 1916 became the home of Clarence and Addie Ostrander. Bert Stanley shot ducks for the market. He packed them in barrels and shipped them to the big Chicago hotels. Bert's sister, Minnie, married Hank Jackson of Grass Lake, and their son Henry lived (1957) in McHenry. Bert's children were Edythe Bridges and George Stanley, who lived at nearby Brandenburg Lake, and Robert, who lived in Chicago. This story of the Stanleys is offered here because their history represents best, perhaps, the life of the early pioneers, and because it portrays so clearly the changes through which the country of the Pistakee Lakes has passed. The downtown business section of the village of Fox Lake stands almost entirely on land that belonged 100 years ago to John Sayles. Through the kindness of his granddaughter, Jane Homan, and her mother, I have learned John Sayles' story. They let me look through old deeds, contracts, and other papers, and they told me what they knew of stories handed down through the family, from generation to generation. In one deed dated Oct. 23, 1848, and signed by David Smith of Addison County, Vermont, conveyed 80 acres to John Sayles of Waukesha, Wis. The land was described at the SE 1/4 of the NE 1/2 and the NE 1/4 of the SE 1/4 of Section 9, Township 45 North, Range 9, west of the 2nd principal meridian. This would be the land now bounded on the north by the alley behind Klaus's store on Grand Ave., on the east by Forest Ave., on the west by Rte. 12, and extending one-half mile. John Sayles also purchased 40 acres directly south of tract, extending to the north line of Kings Island. On these 120 acres are all the business buildings on Grand Ave. between Rte. 12 and Forest, and everything on the east side of 12 from Grand to the Milwaukee Road spur track. South of this track, it includes every business house of both sides of Rte. 12. On Jan. 7, 1850, John Sayles purchased for $25 a small tract lying north of the original piece. This would be everything west of the Fox Lake Grade School and south of the village hall, running west to Rte. 12. His wife Betsy's people had squatted on this hill near the present village hall many years before, but had not been able to buy it because it still belonged legally to the Indians. The names of Betsy Sayles' parents do not appear in any of the deeds. A great-granddaughter of John and Betsy, Ada Anderson, told me that Betsy had been born there and had watched the Indians move out after the Black Hawk War. Ada got the story from her grandmother, Cynthia. It is evident that John Sayles married Betsy soon after he came to this area in 1848. Their first child was a boy, Frank. 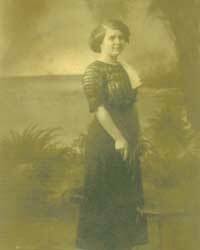 A daughter, Cynthia, was born in 1850, and another son, Ed O. Sayles, was born in 1852. On Aug. 22, 1865, John Sayles bought the west fractional half of the SE 1/4 of Section 9, containing 49 acres, from John and Mary Horan, who had obtained it from William Wisner. This deed was witnessed by Stephen Marvin and his wife, Tryphena. The amount paid was $250. This land lies south of the Lagoon Marina and is now largely occupied by Pistakee Portals and Eagle Point Heights. It includes all the Pistakee shoreline there except Eagle Point. On Dec. 31, 1868, John and Betsy Sayles gave $350 and 134 acres of land to their son, Frank, on the stipulation that Frank was to feed, clothe, furnish medinicos [sic], house and otherwise maintain his parents. When the younger brother, Ed (then 16), reached 21, Frank was to deed half of the land to him. This contract, however, was never fulfilled. Frank took off with a man named Dowell for the California gold fields. Dowell, it is said, came back alone and rich. Frank never returned. John Sayles died in 1879. In 1883 his widow, Betsy, issued a quitclaim for all the land to her son, Ed. I asked how Cynthia had not been mentioned in these transactions, and was told that old John had not favored her marriage at the age of 15 to Harry Dunnell. Her brother, Ed, however, felt that she had been unfairly treated and bought land for her. Part of that land was on Forest Ave. south of Cathryn. She later willed it to her daughter, Mabel. Ed is said to have helped her buy the site of the old Dunnell House in April 1877. There Cynthia and Harry Dunnell started a resort business in a part log, part frame building. This piece of land was previously owned by J.L. Tweed, Robert Stanley and William Wisner. Ed O. Sayles married Betsy Jane, whose last name is not definitely known, and had three children. A daughter Etta married John Dalziel. A second daughter Grace now lives in Florida. 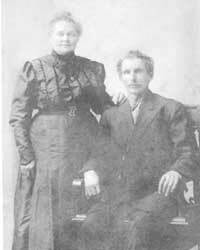 Their son Ernest married Marion Cornus of Hebron, Ill., in 1910, and they had six children. Marian told me that Ernest took off for Oklahoma and never came back. She lives now with her son on S. Rte. 12. Her daughter Jane and husband Elmer Homan operate a sportsmen's supply store on S. Rte. 12. Ed O. Sayles, they say, was sometimes too openhanded for his own good. At times his wife Betsy Jane became so provoked [she would walk in the woods] behind the present  location of the Fox Lake Funeral Home on South Rte. 12. At one time the Sayles family had four houses. One was on a side hill where the Pilgrim Shop now stands, and one, built by Robert Stanley in 1857, stood on the site of the first Betsy Sayles parents' log cabin, near today's village hall. The oldest Sayles house is on S. Rte. 12, where Marian Sayles lives  with her son. Ed Sayles laid out a small subdivision in 1900 at Grand Ave. and Nippersink Blvd. The original plat was notarized by Alex Tweed. The openhanded Ed charged $10 a year for a 90-year lease on each lot, but his wife Betsy Jane called this deal off and sold the lots outright. Ed explained that he just wanted to get the new town started and wasn't trying to make money. The railroad, however, it is said, paid him for the land it used. When the railroad came, Ed went into the bus and hauling business. His and Franklin Marvin's livery barns were on the hill near the site of the new fire station. It is said that Ed did well in this business. He always wanted to do good, and sometimes stood on the street giving money to those who needed it. As Marian told me, his wife Betsy Jane did not think much of this idea and would take off for her house on the hill whenever she got sufficiently annoyed. Ed had a large part in helping the new town get started. He donated land for streets and roads, and entered into many phases of the village's development. Ed O. Sayles was a public-spirited citizen who put the welfare of his community above personal gain. Published in the Fox Lake Press January 31, 1957. There were the first Harry, his wife, and son, Harry Jr. They were squatters in a log cabin on the side of the hill about where the Roy Klaus store stands today. This land then belonged to John Sayles. Old Harry was by all accounts quite a woodsman, hunter and fisherman. Young Harry, having been well taught by his father, soon became his equal, and as the lakes in those days were full of fish and the country abounded in game, they soon entered into the guiding of the hunters and fishermen who were then beginning to come to this country of lakes. Harry Jr. in 1865 married Cynthia Sayles. Cynthia was born in 1850 in a log cabin on the hill near the present fire station. She was the daughter of John and Betsy Sayles. It was said that John did not approve of Cynthia marrying Harry at the age of 15, and so did not provide for her at that time, but the young people were not to be stopped. They walked down to Volo and were married there by Squire Rogers. However, Cynthia's brother, Ed, did not think she had been treated fairly, and later helped her buy the land where she and her husband established the Dunnell House Resort. This would be today on the hill west of Route 12, south of west Oak Street. This site was purchased from J. L. Tweed in 1877. It is evident that before 1849, William Wisner was the first owner of all this land along the Pistakee shore, having taken it up from the government. Cynthia was also deeded other land by her brother, Ed, including a tract adjoining North Forest Avenue. Harry and Cynthia were the parents of a daughter, Mabel, and three sons, Harry, Bert, and Will. They had started their resort in a large log cabin and soon built a large frame building adjoining this cabin; this was the first Dunnell House Resort. The Dunnells had soon established a good resort business. They trapped, hunted and fished, and kept their ice house filled with fish and game, ready for the use of their guests and friends. Old Harry, I have been told, did quite a bit of clamming. Fresh water clams were found in beds, in take shallow water along the shores of the river banks and islands. They were brought up with a large rake, examined for pearls, and the shells sold to the button factories. At one time there was no channel between the Nippersink and Pistakee lakes, where the first bridge is now located. The only channel then was the river to the west. In order that they might bring their boats in close to the hotel, the Dunnell boys with Connie Marble dug a ditch by hand between the two lakes. Connie Marble had a place to the north of the Dunnells, close to where this channel was dug. Later, it was said, Otto Muercke of the Illinois Hotel, aided in the widening of this first channel, providing room for larger boats. This also caused a strong current and fresher water along the east shore of Nippersink Lake. This today is a wide, deep channel, heavily traveled by power boats. The Dunnell boys, as were all of the early lake and river men of this lake country, were expert shots. They, especially Bert, with the Graham brothers of Long Lake, took part in many trap shooting meets. They won many trophies and at one time held the championship of the world for a five man team. It is a matter of record that here in Grant Township there were at one time more expert trapshooters than at any other place in the world. This I will write of later. Nearly all of those old expert trapshooters and hunters have left this earth. They would probably not care for the hunting here today. It was safe to hunt with those men; they were experts in handling guns, they shot to kill game, and seldom missed, and were careful of their fellow men. This is not always true of the hunters today. The old Dunnell house was destroyed by fire about 1896. It was rebuilt a few feet to the south, and again operated as a resort for many years. Old Harry died in 1899 and his widow, Cynthia, lived with her sons at the resort until her death. Mabel Dunnell had married Charles Tilden in 1890. Charles was the son of Horace and Winnie Tilden, who ran the old Lakeside Hotel at that time. Mabel and Charles had a daughter, Florence, and twin sons, Horace and Forrest, who were better known as Pete and Dutch. They were taught to jig when quite young by Frank Gerretsen, and entertained the patrons of the Dunnell house. They also, of course, were experts at hunting and fishing. Forrest died a few years ago and Horace now lives with his nephew, George, of Kings Island. Florence was married to Pete Gendrich. Pete was a strong man and wrestled in carnivals and circuses. His wife, Florence, also was a performer in an act using a version of an electric chair. They had two sons, Charles and George. They were taught to wrestle in the carnivals when small boys. Florence was burned to death in a fire caused by an explosion of their gasoline stove in their trailer at Pontiac, Ill. in 1923. They were then traveling with the Ringling Bros. Circus. Charles now lives in Chicago, and George Gendrich lives at Kings Island. Pete, the father, was said to be quite a man. He was known to pull automobiles around with his teeth, and was also the first Fox Lake police officer to ride a motorcycle, and served under Frank Gerretsen, who was the town marshal in 1919-1920 under Mayor William Nagle. Mabel separated from Charles Tilden about 1895. Charles went to northern Wisconsin, and Mabel married Frank Gerretsen. They had two daughters: Iva, who died in 1956, and Ada, who lives in Fox Lake with her husband, John Anderson. Frank and Mabel have both passed away. There are today none of the Dunnells living except Ada and Horace, the children of Mabel, and her grandsons, Charles and George Gendrich. The old Dunnell house was quite a place in its day. The old hunters and trapshooters with their stories and experience, both famous and infamous. The barrels of ducks and fish being shipped to the Chicago hotels. The mail and supplies coming in on the old steamboats. Old Captain Hill on the Mary Griswold coming up from McHenry blowing from the landings: three blasts on the whistle for one horse-drawn bus to take off his passengers, or four blasts if more than one bus was needed. Those colorful times of plenty are today but history. This page was last updated on January 20, 2007. © Copyright 1999-2007 Fox Lake-Grant Township Area Historical Society. All Rights Reserved.